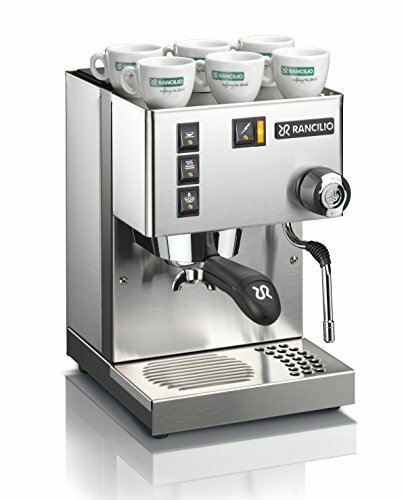 As one of the best types of espresso machines available on the market today, the Rancilio Silvia stands far above other espresso machines or coffee makers that you’ll see on store shelves. For the home barista who is serious about their espresso, the Rancilio Silvia is a commercial-style espresso machine that includes professional-grade components. And now that you know all about how great your Rancilio is supposed to be, you’re probably terrified to try it out. After all, you probably don’t consider yourself the perfect barista, so how are you ever supposed to make professional-tasting espresso coffee with this daunting Lord of Espresso Coffee Machines? Never fear, there is hope! No fancy Italian import of a machine can defeat the power of an informed homeowner, armed with a step-by-step tutorial! You can and you will make the perfect espresso – that IS why you bought this machine in the first place, right? 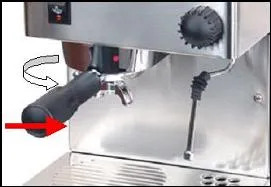 Step 1: Once you’ve set up your Rancilio Silvia espresso machine, your first step should be to fill up the water reservoir at the back, being careful not to exceed maximum capacity. There will be a fill line near the top of the tank that indicates the maximum amount of water that can be placed inside. 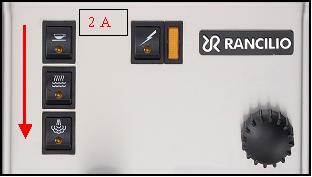 Step 2a: Check to make sure that all the switches are set in the “off” position, and then plug the espresso machine into an appropriate outlet. Step 2b: Then, like all good appliances, you’ll need to turn it ON before you can actually make the espresso. 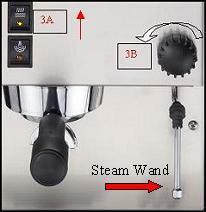 Before you can get started on making your espresso, you’ll have to allow the machine to heat up. 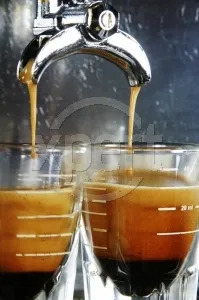 Just like you would let an oven reach the correct temperature before baking a casserole, most espresso coffee machines need to reach their own correct internal temperature before being able to produce the “perfect brew”. 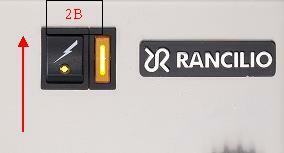 Wait until the rectangular orange light next to the power switch goes out: this means the temperature is right. Step 3: You can then take the edge off your espresso cups by preheating those, too – place the cups under the steam wand. Step 3A: Turn on the hot water button. Step 3B: Turn the round button counterclockwise to allow just enough water to fill the cups. Step 3C: Turn the hot water button off. Step 3D: Close the steam wand valve. Step 4: After everything’s been heated up, it is time to get brewing. 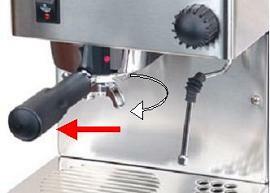 So, remove the portafilter from its place on the left-hand side of your espresso machine. Step 5: The basket held by the portafilter is where you’re going to want to dose your ground coffee. For best results – which is obviously what you’re going for if you’ve purchased this high-class machine – use freshly ground coffee. To be honest, stale coffee may result in espresso that tastes a bit off. Step 6: Unlike a regular home coffee brewer, you can’t just place the grounds in an espresso machine and be done with them! There’s another step: you want to press down on the coffee grounds. This is called tamping the grind. Use about 30 lbs of pressure as you press down with the tamper, being sure to give a 90-degree twist before easing off. Step 7: During tamping, it’s possible that some loose grounds can migrate toward the edge of the portafilter – so take your tamper and tap it a few times against the portafilter, getting rid of any grounds along the rim. You can also brush them off. Step 8: Now that you have a portafilter of tamped coffee grounds, you can install it back onto your Rancilio Silvia, using a left to right motion to lock it in place. The portafilter should be almost lined up with the red dot along the front, which lets you know that it’s been inserted properly. Step 9: Finally, the exciting part: press the button to start brewing! A 2-ounce shot is typically considered a ‘double-shot’, and this espresso machine should take only about 25 seconds to produce a double. Don’t remove the cups too fast though – see that little bit of froth on top? That’s the espresso crema, a brown foam that collects on top of your shot as it brews. A good, thick crema is an indication of a great brew. Step 10: And as tasty as your espresso was, you also need to remember to clean the machine afterward, in order to keep it in top condition. All commercial espresso machines and grinders need regular maintenance to ensure longevity – and really, once you’ve tasted the Rancilio Silvia espresso, you’ll definitely want this machine to last. After every use, make sure you empty the coffee grinds from the portafilter and run it under hot water. The spouts can easily be kept clean by allowing hot water from the reservoir to flow through while the machine is still warm – not to mention that this will also help prevent any stains from developing on the machine. Clean the group head, seal with a brush and you’re done.